A fuel cell is an electrochemical cell that converts the chemical energy of a fuel (often hydrogen) and an oxidizing agent (often oxygen) into electricity through a pair of redox reactions. 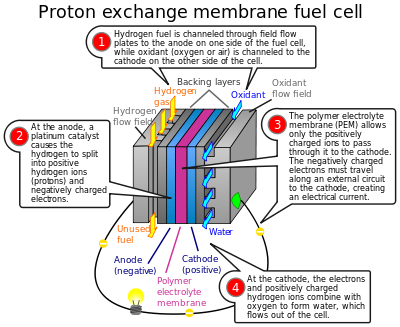 Fuel cells are different from most batteries in requiring a continuous source of fuel and oxygen (usually from air) to sustain the chemical reaction, whereas in a battery the chemical energy usually comes from metals and their ions or oxides  that are commonly already present in the battery, except in flow batteries. Fuel cells can produce electricity continuously for as long as fuel and oxygen are supplied. 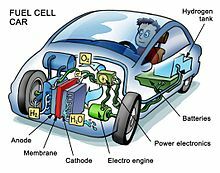 There are many types of fuel cells, but they all consist of an anode, a cathode, and an electrolyte that allows ions, often positively charged hydrogen ions (protons), to move between the two sides of the fuel cell. At the anode a catalyst causes the fuel to undergo oxidation reactions that generate ions (often positively charged hydrogen ions) and electrons. 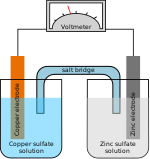 The ions move from the anode to the cathode through the electrolyte. At the same time, electrons flow from the anode to the cathode through an external circuit, producing direct current electricity. At the cathode, another catalyst causes ions, electrons, and oxygen to react, forming water and possibly other products. Fuel cells are classified by the type of electrolyte they use and by the difference in startup time ranging from 1 second for proton exchange membrane fuel cells (PEM fuel cells, or PEMFC) to 10 minutes for solid oxide fuel cells (SOFC). A related technology is flow batteries, in which the fuel can be regenerated by recharging. Individual fuel cells produce relatively small electrical potentials, about 0.7 volts, so cells are "stacked", or placed in series, to create sufficient voltage to meet an application's requirements. In addition to electricity, fuel cells produce water, heat and, depending on the fuel source, very small amounts of nitrogen dioxide and other emissions. The energy efficiency of a fuel cell is generally between 40–60%; however, if waste heat is captured in a cogeneration scheme, efficiencies up to 85% can be obtained. The first references to hydrogen fuel cells appeared in 1838. In a letter dated October 1838 but published in the December 1838 edition of The London and Edinburgh Philosophical Magazine and Journal of Science, Welsh physicist and barrister William Grove wrote about the development of his first crude fuel cells. He used a combination of sheet iron, copper and porcelain plates, and a solution of sulphate of copper and dilute acid. In a letter to the same publication written in December 1838 but published in June 1839, German physicist Christian Friedrich Schönbein discussed the first crude fuel cell that he had invented. His letter discussed current generated from hydrogen and oxygen dissolved in water. Grove later sketched his design, in 1842, in the same journal. The fuel cell he made used similar materials to today's phosphoric-acid fuel cell. In 1939, British engineer Francis Thomas Bacon successfully developed a 5 kW stationary fuel cell. In 1955, W. Thomas Grubb, a chemist working for the General Electric Company (GE), further modified the original fuel cell design by using a sulphonated polystyrene ion-exchange membrane as the electrolyte. Three years later another GE chemist, Leonard Niedrach, devised a way of depositing platinum onto the membrane, which served as catalyst for the necessary hydrogen oxidation and oxygen reduction reactions. 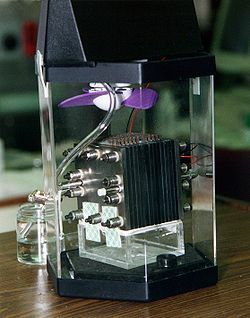 This became known as the "Grubb-Niedrach fuel cell". GE went on to develop this technology with NASA and McDonnell Aircraft, leading to its use during Project Gemini. This was the first commercial use of a fuel cell. In 1959, a team led by Harry Ihrig built a 15 kW fuel cell tractor for Allis-Chalmers, which was demonstrated across the U.S. at state fairs. This system used potassium hydroxide as the electrolyte and compressed hydrogen and oxygen as the reactants. Later in 1959, Bacon and his colleagues demonstrated a practical five-kilowatt unit capable of powering a welding machine. In the 1960s, Pratt and Whitney licensed Bacon's U.S. patents for use in the U.S. space program to supply electricity and drinking water (hydrogen and oxygen being readily available from the spacecraft tanks). In 1991, the first hydrogen fuel cell automobile was developed by Roger Billings. UTC Power was the first company to manufacture and commercialize a large, stationary fuel cell system for use as a co-generation power plant in hospitals, universities and large office buildings. In recognition of the fuel cell industry and America’s role in fuel cell development, the US Senate recognized 8 October 2015 as National Hydrogen and Fuel Cell Day, passing S. RES 217. The date was chosen in recognition of the atomic weight of hydrogen (1.008). At the anode a catalyst oxidizes the fuel, usually hydrogen, turning the fuel into a positively charged ion and a negatively charged electron. The electrolyte is a substance specifically designed so ions can pass through it, but the electrons cannot. The freed electrons travel through a wire creating the electric current. The ions travel through the electrolyte to the cathode. Once reaching the cathode, the ions are reunited with the electrons and the two react with a third chemical, usually oxygen, to create water or carbon dioxide. The electrolyte substance, which usually defines the type of fuel cell, and can be made from a number of substances like potassium hydroxide, salt carbonates, and phosphoric acid. The fuel that is used. The most common fuel is hydrogen. The anode catalyst, usually fine platinum powder, breaks down the fuel into electrons and ions. The cathode catalyst, often nickel, converts ions into waste chemicals, with water being the most common type of waste. Gas diffusion layers that are designed to resist oxidization. Mass transport loss (depletion of reactants at catalyst sites under high loads, causing rapid loss of voltage). To deliver the desired amount of energy, the fuel cells can be combined in series to yield higher voltage, and in parallel to allow a higher current to be supplied. Such a design is called a fuel cell stack. The cell surface area can also be increased, to allow higher current from each cell. Within the stack, reactant gases must be distributed uniformly over each of the cells to maximize the power output. Construction of a high-temperature PEMFC: Bipolar plate as electrode with in-milled gas channel structure, fabricated from conductive composites (enhanced with graphite, carbon black, carbon fiber, and/or carbon nanotubes for more conductivity); Porous carbon papers; reactive layer, usually on the polymer membrane applied; polymer membrane. Condensation of water produced by a PEMFC on the air channel wall. The gold wire around the cell ensures the collection of electric current. SEM micrograph of a PEMFC MEA cross-section with a non-precious metal catalyst cathode and Pt/C anode. False colors applied for clarity. On the anode side, hydrogen diffuses to the anode catalyst where it later dissociates into protons and electrons. These protons often react with oxidants causing them to become what are commonly referred to as multi-facilitated proton membranes. The protons are conducted through the membrane to the cathode, but the electrons are forced to travel in an external circuit (supplying power) because the membrane is electrically insulating. On the cathode catalyst, oxygen molecules react with the electrons (which have traveled through the external circuit) and protons to form water. In addition to this pure hydrogen type, there are hydrocarbon fuels for fuel cells, including diesel, methanol (see: direct-methanol fuel cells and indirect methanol fuel cells) and chemical hydrides. The waste products with these types of fuel are carbon dioxide and water. When hydrogen is used, the CO2 is released when methane from natural gas is combined with steam, in a process called steam methane reforming, to produce the hydrogen. This can take place in a different location to the fuel cell, potentially allowing the hydrogen fuel cell to be used indoors—for example, in fork lifts. the necessary hardware such as current collectors and gaskets. The materials used for different parts of the fuel cells differ by type. The bipolar plates may be made of different types of materials, such as, metal, coated metal, graphite, flexible graphite, C–C composite, carbon–polymer composites etc. The membrane electrode assembly (MEA) is referred as the heart of the PEMFC and is usually made of a proton exchange membrane sandwiched between two catalyst-coated carbon papers. Platinum and/or similar type of noble metals are usually used as the catalyst for PEMFC. The electrolyte could be a polymer membrane. Cost. In 2013, the Department of Energy estimated that 80-kW automotive fuel cell system costs of US$67 per kilowatt could be achieved, assuming volume production of 100,000 automotive units per year and US$55 per kilowatt could be achieved, assuming volume production of 500,000 units per year. Many companies are working on techniques to reduce cost in a variety of ways including reducing the amount of platinum needed in each individual cell. Ballard Power Systems has experimented with a catalyst enhanced with carbon silk, which allows a 30% reduction (1 mg/cm² to 0.7 mg/cm²) in platinum usage without reduction in performance. Monash University, Melbourne uses PEDOT as a cathode. A 2011 published study doi: 10.1021/ja1112904 documented the first metal-free electrocatalyst using relatively inexpensive doped carbon nanotubes, which are less than 1% the cost of platinum and are of equal or superior performance. A recently published article demonstrated how the environmental burdens change when using carbon nanotubes as carbon substrate for platinum. Water and air management (in PEMFCs). In this type of fuel cell, the membrane must be hydrated, requiring water to be evaporated at precisely the same rate that it is produced. If water is evaporated too quickly, the membrane dries, resistance across it increases, and eventually it will crack, creating a gas "short circuit" where hydrogen and oxygen combine directly, generating heat that will damage the fuel cell. If the water is evaporated too slowly, the electrodes will flood, preventing the reactants from reaching the catalyst and stopping the reaction. Methods to manage water in cells are being developed like electroosmotic pumps focusing on flow control. Just as in a combustion engine, a steady ratio between the reactant and oxygen is necessary to keep the fuel cell operating efficiently. Temperature management. The same temperature must be maintained throughout the cell in order to prevent destruction of the cell through thermal loading. This is particularly challenging as the 2H2 + O2 -> 2H2O reaction is highly exothermic, so a large quantity of heat is generated within the fuel cell. Durability, service life, and special requirements for some type of cells. Stationary fuel cell applications typically require more than 40,000 hours of reliable operation at a temperature of −35 °C to 40 °C (−31 °F to 104 °F), while automotive fuel cells require a 5,000-hour lifespan (the equivalent of 240,000 km (150,000 mi)) under extreme temperatures. Current service life is 2,500 hours (about 75,000 miles). Automotive engines must also be able to start reliably at −30 °C (−22 °F) and have a high power-to-volume ratio (typically 2.5 kW per liter). Limited carbon monoxide tolerance of some (non-PEDOT) cathodes. 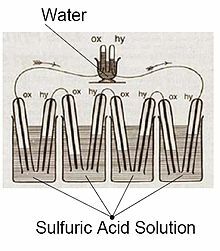 Solid acid fuel cells (SAFCs) are characterized by the use of a solid acid material as the electrolyte. At low temperatures, solid acids have an ordered molecular structure like most salts. At warmer temperatures (between 140 and 150 degrees Celsius for CsHSO4), some solid acids undergo a phase transition to become highly disordered "superprotonic" structures, which increases conductivity by several orders of magnitude. The first proof-of-concept SAFCs were developed in 2000 using cesium hydrogen sulfate (CsHSO4). Current SAFC systems use cesium dihydrogen phosphate (CsH2PO4) and have demonstrated lifetimes in the thousands of hours. The alkaline fuel cell or hydrogen-oxygen fuel cell was designed and first demonstrated publicly by Francis Thomas Bacon in 1959. It was used as a primary source of electrical energy in the Apollo space program. The cell consists of two porous carbon electrodes impregnated with a suitable catalyst such as Pt, Ag, CoO, etc. The space between the two electrodes is filled with a concentrated solution of KOH or NaOH which serves as an electrolyte. H2 gas and O2 gas are bubbled into the electrolyte through the porous carbon electrodes. Thus the overall reaction involves the combination of hydrogen gas and oxygen gas to form water. The cell runs continuously until the reactant's supply is exhausted. This type of cell operates efficiently in the temperature range 343 K to 413 K and provides a potential of about 0.9 V. AAEMFC is a type of AFC which employs a solid polymer electrolyte instead of aqueous potassium hydroxide (KOH) and it is superior to aqueous AFC. Solid oxide fuel cells (SOFCs) use a solid material, most commonly a ceramic material called yttria-stabilized zirconia (YSZ), as the electrolyte. Because SOFCs are made entirely of solid materials, they are not limited to the flat plane configuration of other types of fuel cells and are often designed as rolled tubes. They require high operating temperatures (800–1000 °C) and can be run on a variety of fuels including natural gas. SOFC systems can run on fuels other than pure hydrogen gas. However, since hydrogen is necessary for the reactions listed above, the fuel selected must contain hydrogen atoms. 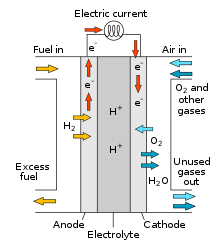 For the fuel cell to operate, the fuel must be converted into pure hydrogen gas. SOFCs are capable of internally reforming light hydrocarbons such as methane (natural gas), propane and butane. These fuel cells are at an early stage of development. Challenges exist in SOFC systems due to their high operating temperatures. One such challenge is the potential for carbon dust to build up on the anode, which slows down the internal reforming process. Research to address this "carbon coking" issue at the University of Pennsylvania has shown that the use of copper-based cermet (heat-resistant materials made of ceramic and metal) can reduce coking and the loss of performance. Another disadvantage of SOFC systems is slow start-up time, making SOFCs less useful for mobile applications. Despite these disadvantages, a high operating temperature provides an advantage by removing the need for a precious metal catalyst like platinum, thereby reducing cost. Additionally, waste heat from SOFC systems may be captured and reused, increasing the theoretical overall efficiency to as high as 80%–85%. The high operating temperature is largely due to the physical properties of the YSZ electrolyte. As temperature decreases, so does the ionic conductivity of YSZ. Therefore, to obtain optimum performance of the fuel cell, a high operating temperature is required. According to their website, Ceres Power, a UK SOFC fuel cell manufacturer, has developed a method of reducing the operating temperature of their SOFC system to 500–600 degrees Celsius. They replaced the commonly used YSZ electrolyte with a CGO (cerium gadolinium oxide) electrolyte. The lower operating temperature allows them to use stainless steel instead of ceramic as the cell substrate, which reduces cost and start-up time of the system. Molten carbonate fuel cells (MCFCs) require a high operating temperature, 650 °C (1,200 °F), similar to SOFCs. MCFCs use lithium potassium carbonate salt as an electrolyte, and this salt liquefies at high temperatures, allowing for the movement of charge within the cell – in this case, negative carbonate ions. As with SOFCs, MCFC disadvantages include slow start-up times because of their high operating temperature. This makes MCFC systems not suitable for mobile applications, and this technology will most likely be used for stationary fuel cell purposes. The main challenge of MCFC technology is the cells' short life span. The high-temperature and carbonate electrolyte lead to corrosion of the anode and cathode. These factors accelerate the degradation of MCFC components, decreasing the durability and cell life. Researchers are addressing this problem by exploring corrosion-resistant materials for components as well as fuel cell designs that may increase cell life without decreasing performance. MCFCs hold several advantages over other fuel cell technologies, including their resistance to impurities. They are not prone to "carbon coking", which refers to carbon build-up on the anode that results in reduced performance by slowing down the internal fuel reforming process. Therefore, carbon-rich fuels like gases made from coal are compatible with the system. The Department of Energy claims that coal, itself, might even be a fuel option in the future, assuming the system can be made resistant to impurities such as sulfur and particulates that result from converting coal into hydrogen. MCFCs also have relatively high efficiencies. They can reach a fuel-to-electricity efficiency of 50%, considerably higher than the 37–42% efficiency of a phosphoric acid fuel cell plant. Efficiencies can be as high as 65% when the fuel cell is paired with a turbine, and 85% if heat is captured and used in a Combined Heat and Power (CHP) system. FuelCell Energy, a Connecticut-based fuel cell manufacturer, develops and sells MCFC fuel cells. The company says that their MCFC products range from 300 kW to 2.8 MW systems that achieve 47% electrical efficiency and can utilize CHP technology to obtain higher overall efficiencies. One product, the DFC-ERG, is combined with a gas turbine and, according to the company, it achieves an electrical efficiency of 65%. The electric storage fuel cell is a conventional battery chargeable by electric power input, using the conventional electro-chemical effect. However, the battery further includes hydrogen (and oxygen) inputs for alternatively charging the battery chemically. Anode: The electrode at which oxidation (a loss of electrons) takes place. For fuel cells and other galvanic cells, the anode is the negative terminal; for electrolytic cells (where electrolysis occurs), the anode is the positive terminal. Aqueous solution: a: of, relating to, or resembling water b : made from, with, or by water. Catalyst: A chemical substance that increases the rate of a reaction without being consumed; after the reaction, it can potentially be recovered from the reaction mixture and is chemically unchanged. The catalyst lowers the activation energy required, allowing the reaction to proceed more quickly or at a lower temperature. In a fuel cell, the catalyst facilitates the reaction of oxygen and hydrogen. It is usually made of platinum powder very thinly coated onto carbon paper or cloth. The catalyst is rough and porous so the maximum surface area of the platinum can be exposed to the hydrogen or oxygen. 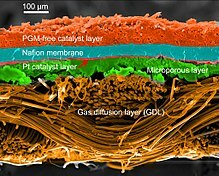 The platinum-coated side of the catalyst faces the membrane in the fuel cell. Cathode: The electrode at which reduction (a gain of electrons) occurs. 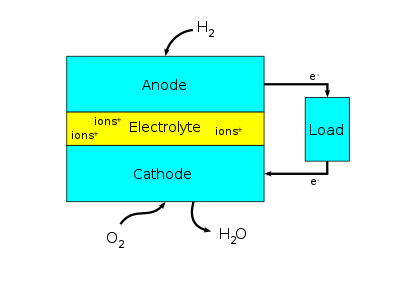 For fuel cells and other galvanic cells, the cathode is the positive terminal; for electrolytic cells (where electrolysis occurs), the cathode is the negative terminal. Electrolyte: A substance that conducts charged ions from one electrode to the other in a fuel cell, battery, or electrolyzer. Fuel Cell Stack: Individual fuel cells connected in a series. Fuel cells are stacked to increase voltage. Matrix: something within or from which something else originates, develops, or takes form. Membrane: The separating layer in a fuel cell that acts as electrolyte (an ion-exchanger) as well as a barrier film separating the gases in the anode and cathode compartments of the fuel cell. Molten carbonate fuel cell (MCFC): A type of fuel cell that contains a molten carbonate electrolyte. Carbonate ions (CO32−) are transported from the cathode to the anode. Operating temperatures are typically near 650 °C. Phosphoric acid fuel cell (PAFC): A type of fuel cell in which the electrolyte consists of concentrated phosphoric acid (H3PO4). Protons (H+) are transported from the anode to the cathode. The operating temperature range is generally 160–220 °C. Proton exchange membrane fuel cell (PEM): A fuel cell incorporating a solid polymer membrane used as its electrolyte. Protons (H+) are transported from the anode to the cathode. The operating temperature range is generally 60–100 °C. Solid oxide fuel cell (SOFC): A type of fuel cell in which the electrolyte is a solid, nonporous metal oxide, typically zirconium oxide (ZrO2) treated with Y2O3, and O2− is transported from the cathode to the anode. Any CO in the reformate gas is oxidized to CO2 at the anode. Temperatures of operation are typically 800–1,000 °C. The energy efficiency of a system or device that converts energy is measured by the ratio of the amount of useful energy put out by the system ("output energy") to the total amount of energy that is put in ("input energy") or by useful output energy as a percentage of the total input energy. In the case of fuel cells, useful output energy is measured in electrical energy produced by the system. Input energy is the energy stored in the fuel. According to the U.S. Department of Energy, fuel cells are generally between 40–60% energy efficient. This is higher than some other systems for energy generation. For example, the typical internal combustion engine of a car is about 25% energy efficient. In combined heat and power (CHP) systems, the heat produced by the fuel cell is captured and put to use, increasing the efficiency of the system to up to 85–90%. The theoretical maximum efficiency of any type of power generation system is never reached in practice, and it does not consider other steps in power generation, such as production, transportation and storage of fuel and conversion of the electricity into mechanical power. However, this calculation allows the comparison of different types of power generation. The maximum theoretical energy efficiency of a fuel cell is 83%, operating at low power density and using pure hydrogen and oxygen as reactants (assuming no heat recapture) According to the World Energy Council, this compares with a maximum theoretical efficiency of 58% for internal combustion engines. In a fuel-cell vehicle the tank-to-wheel efficiency is greater than 45% at low loads and shows average values of about 36% when a driving cycle like the NEDC (New European Driving Cycle) is used as test procedure. The comparable NEDC value for a Diesel vehicle is 22%. In 2008 Honda released a demonstration fuel cell electric vehicle (the Honda FCX Clarity) with fuel stack claiming a 60% tank-to-wheel efficiency. It is also important to take losses due to fuel production, transportation, and storage into account. Fuel cell vehicles running on compressed hydrogen may have a power-plant-to-wheel efficiency of 22% if the hydrogen is stored as high-pressure gas, and 17% if it is stored as liquid hydrogen. Fuel cells cannot store energy like a battery, except as hydrogen, but in some applications, such as stand-alone power plants based on discontinuous sources such as solar or wind power, they are combined with electrolyzers and storage systems to form an energy storage system. Most hydrogen is used for oil refining, chemicals and fertilizer production and therefore produced by steam methane reforming, which emits carbon dioxide. The overall efficiency (electricity to hydrogen and back to electricity) of such plants (known as round-trip efficiency), using pure hydrogen and pure oxygen can be "from 35 up to 50 percent", depending on gas density and other conditions. The electrolyzer/fuel cell system can store indefinite quantities of hydrogen, and is therefore suited for long-term storage. Solid-oxide fuel cells produce heat from the recombination of the oxygen and hydrogen. The ceramic can run as hot as 800 degrees Celsius. This heat can be captured and used to heat water in a micro combined heat and power (m-CHP) application. When the heat is captured, total efficiency can reach 80–90% at the unit, but does not consider production and distribution losses. CHP units are being developed today for the European home market. Professor Jeremy P. Meyers, in the Electrochemical Society journal Interface in 2008, wrote, "While fuel cells are efficient relative to combustion engines, they are not as efficient as batteries, due primarily to the inefficiency of the oxygen reduction reaction (and ... the oxygen evolution reaction, should the hydrogen be formed by electrolysis of water).... [T]hey make the most sense for operation disconnected from the grid, or when fuel can be provided continuously. For applications that require frequent and relatively rapid start-ups ... where zero emissions are a requirement, as in enclosed spaces such as warehouses, and where hydrogen is considered an acceptable reactant, a [PEM fuel cell] is becoming an increasingly attractive choice [if exchanging batteries is inconvenient]". In 2013 military organizations are evaluating fuel cells to significantly reduce the battery weight carried by soldiers. Stationary fuel cells are used for commercial, industrial and residential primary and backup power generation. Fuel cells are very useful as power sources in remote locations, such as spacecraft, remote weather stations, large parks, communications centers, rural locations including research stations, and in certain military applications. A fuel cell system running on hydrogen can be compact and lightweight, and have no major moving parts. Because fuel cells have no moving parts and do not involve combustion, in ideal conditions they can achieve up to 99.9999% reliability. This equates to less than one minute of downtime in a six-year period. 2) for every 1,000 kW·h produced, compared to 25 pounds of pollutants generated by conventional combustion systems. Fuel Cells also produce 97% less nitrogen oxide emissions than conventional coal-fired power plants. One such pilot program is operating on Stuart Island in Washington State. There the Stuart Island Energy Initiative has built a complete, closed-loop system: Solar panels power an electrolyzer, which makes hydrogen. The hydrogen is stored in a 500-U.S.-gallon (1,900 L) tank at 200 pounds per square inch (1,400 kPa), and runs a ReliOn fuel cell to provide full electric back-up to the off-the-grid residence. Another closed system loop was unveiled in late 2011 in Hempstead, NY. Fuel cells can be used with low-quality gas from landfills or waste-water treatment plants to generate power and lower methane emissions. A 2.8 MW fuel cell plant in California is said to be the largest of the type. Combined heat and power (CHP) fuel cell systems, including Micro combined heat and power (MicroCHP) systems are used to generate both electricity and heat for homes (see home fuel cell), office building and factories. The system generates constant electric power (selling excess power back to the grid when it is not consumed), and at the same time produces hot air and water from the waste heat. As the result CHP systems have the potential to save primary energy as they can make use of waste heat which is generally rejected by thermal energy conversion systems. A typical capacity range of home fuel cell is 1–3 kWel / 4–8 kWth. CHP systems linked to absorption chillers use their waste heat for refrigeration. Co-generation systems can reach 85% efficiency (40–60% electric + remainder as thermal). Phosphoric-acid fuel cells (PAFC) comprise the largest segment of existing CHP products worldwide and can provide combined efficiencies close to 90%. Molten Carbonate (MCFC) and Solid Oxide Fuel Cells (SOFC) are also used for combined heat and power generation and have electrical energy efficiences around 60%. Disadvantages of co-generation systems include slow ramping up and down rates, high cost and short lifetime. Also their need to have a hot water storage tank to smooth out the thermal heat production was a serious disadvantage in the domestic market place where space in domestic properties is at a great premium. Delta-ee consultants stated in 2013 that with 64% of global sales the fuel cell micro-combined heat and power passed the conventional systems in sales in 2012. The Japanese ENE FARM project will pass 100,000 FC mCHP systems in 2014, 34.213 PEMFC and 2.224 SOFC were installed in the period 2012-2014, 30,000 units on LNG and 6,000 on LPG. As of 2017, about 6500 FCEVs have been leased or sold worldwide. Three fuel cell electric vehicles have been introduced for commercial lease and sale: the Honda Clarity, Toyota Mirai and the Hyundai ix35 FCEV. Additional demonstration models include the Honda FCX Clarity, and Mercedes-Benz F-Cell. As of June 2011 demonstration FCEVs had driven more than 4,800,000 km (3,000,000 mi), with more than 27,000 refuelings. Fuel cell electric vehicles feature an average range of 314 miles between refuelings. They can be refueled in less than 5 minutes. The U.S. Department of Energy's Fuel Cell Technology Program states that, as of 2011, fuel cells achieved 53–59% efficiency at one-quarter power and 42–53% vehicle efficiency at full power, and a durability of over 120,000 km (75,000 mi) with less than 10% degradation. In a Well-to-Wheels simulation analysis that "did not address the economics and market constraints", General Motors and its partners estimated that per mile traveled, a fuel cell electric vehicle running on compressed gaseous hydrogen produced from natural gas could use about 40% less energy and emit 45% less greenhouse gasses than an internal combustion vehicle. A lead engineer from the Department of Energy whose team is testing fuel cell cars said in 2011 that the potential appeal is that "these are full-function vehicles with no limitations on range or refueling rate so they are a direct replacement for any vehicle. For instance, if you drive a full sized SUV and pull a boat up into the mountains, you can do that with this technology and you can't with current battery-only vehicles, which are more geared toward city driving." In 2015, Toyota introduced its first fuel cell vehicle, the Mirai, at a price of $57,000. Hyundai introduced the limited production Hyundai ix35 FCEV under a lease agreement. In 2016, Honda started leasing the Honda Clarity Fuel Cell. Some commentators believe that hydrogen fuel cell cars will never become economically competitive with other technologies or that it will take decades for them to become profitable. Elon Musk, CEO of battery-electric vehicle maker Tesla Motors, stated in 2015 that fuel cells for use in cars will never be commercially viable because of the inefficiency of producing, transporting and storing hydrogen and the flammability of the gas, among other reasons. Professor Jeremy P. Meyers estimated in 2008 that cost reductions over a production ramp-up period will take about 20 years after fuel-cell cars are introduced before they will be able to compete commercially with current market technologies, including gasoline internal combustion engines. In 2011, the chairman and CEO of General Motors, Daniel Akerson, stated that while the cost of hydrogen fuel cell cars is decreasing: "The car is still too expensive and probably won't be practical until the 2020-plus period, I don't know." In 2012, Lux Research, Inc. issued a report that stated: "The dream of a hydrogen economy ... is no nearer". It concluded that "Capital cost ... will limit adoption to a mere 5.9 GW" by 2030, providing "a nearly insurmountable barrier to adoption, except in niche applications". The analysis concluded that, by 2030, PEM stationary market will reach $1 billion, while the vehicle market, including forklifts, will reach a total of $2 billion. Other analyses cite the lack of an extensive hydrogen infrastructure in the U.S. as an ongoing challenge to Fuel Cell Electric Vehicle commercialization. In 2006, a study for the IEEE showed that for hydrogen produced via electrolysis of water: "Only about 25% of the power generated from wind, water, or sun is converted to practical use." The study further noted that "Electricity obtained from hydrogen fuel cells appears to be four times as expensive as electricity drawn from the electrical transmission grid. ... Because of the high energy losses [hydrogen] cannot compete with electricity." Furthermore, the study found: "Natural gas reforming is not a sustainable solution". "The large amount of energy required to isolate hydrogen from natural compounds (water, natural gas, biomass), package the light gas by compression or liquefaction, transfer the energy carrier to the user, plus the energy lost when it is converted to useful electricity with fuel cells, leaves around 25% for practical use." In 2014, Joseph Romm, the author of The Hype About Hydrogen (2005), stated that FCVs still had not overcome the high fueling cost, lack of fuel-delivery infrastructure, and pollution caused by producing hydrogen. "It would take several miracles to overcome all of those problems simultaneously in the coming decades." He concluded that renewable energy cannot economically be used to make hydrogen for an FCV fleet "either now or in the future." Greentech Media's analyst reached similar conclusions in 2014. In 2015, Clean Technica listed some of the disadvantages of hydrogen fuel cell vehicles. So did Car Throttle. Toyota FCHV-BUS at the Expo 2005. 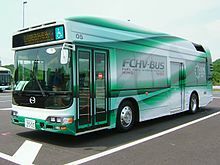 As of August 2011[update], there were a total of approximately 100 fuel cell buses deployed around the world. Most buses are produced by UTC Power, Toyota, Ballard, Hydrogenics, and Proton Motor. UTC buses had accumulated over 970,000 km (600,000 mi) of driving by 2011. Fuel cell buses have a 39–141% higher fuel economy than diesel buses and natural gas buses. Fuel cell buses have been deployed around the world including in Whistler, Canada; San Francisco, United States; Hamburg, Germany; Shanghai, China; London, England; and São Paulo, Brazil. 12 fuel cell buses are being deployed in the Oakland and San Francisco Bay area of California. Daimler AG, with 36 experimental buses powered by Ballard Power Systems fuel cells, completed a successful three-year trial in eleven cities, in January 2007. A fleet of Thor buses with UTC Power fuel cells was deployed in California, operated by SunLine Transit Agency. The first Brazilian hydrogen fuel cell bus prototype in Brazil was deployed in São Paulo. The bus was manufactured in Caxias do Sul and the hydrogen fuel will be produced in São Bernardo do Campo from water through electrolysis. The program, called "Ônibus Brasileiro a Hidrogênio" (Brazilian Hydrogen Autobus), includes three additional buses. A fuel cell forklift (also called a fuel cell lift truck) is a fuel cell-powered industrial forklift truck used to lift and transport materials. In 2013 there were over 4,000 fuel cell forklifts used in material handling in the US, of which only 500 received funding from DOE (2012). The global market is 1 million fork lifts per year. Fuel cell fleets are operated by various companies, including Sysco Foods, FedEx Freight, GENCO (at Wegmans, Coca-Cola, Kimberly Clark, and Whole Foods), and H-E-B Grocers. Europe demonstrated 30 fuel cell forklifts with Hylift and extended it with HyLIFT-EUROPE to 200 units, with other projects in France  and Austria. Pike Research stated in 2011 that fuel cell-powered forklifts will be the largest driver of hydrogen fuel demand by 2020. Most companies in Europe and the US do not use petroleum-powered forklifts, as these vehicles work indoors where emissions must be controlled and instead use electric forklifts. Fuel cell-powered forklifts can provide benefits over battery-powered forklifts as they can work for a full 8-hour shift on a single tank of hydrogen and can be refueled in 3 minutes. Fuel cell-powered forklifts can be used in refrigerated warehouses, as their performance is not degraded by lower temperatures. The FC units are often designed as drop-in replacements. In 2005 a British manufacturer of hydrogen-powered fuel cells, Intelligent Energy (IE), produced the first working hydrogen run motorcycle called the ENV (Emission Neutral Vehicle). The motorcycle holds enough fuel to run for four hours, and to travel 160 km (100 mi) in an urban area, at a top speed of 80 km/h (50 mph). In 2004 Honda developed a fuel-cell motorcycle that utilized the Honda FC Stack. Other examples of motorbikes and bicycles that use hydrogen fuel cells include the Taiwanese company APFCT's scooter using the fueling system from Italy's Acta SpA and the Suzuki Burgman scooter with an IE fuel cell that received EU Whole Vehicle Type Approval in 2011. Suzuki Motor Corp. and IE have announced a joint venture to accelerate the commercialization of zero-emission vehicles. In 2003, the world's first propeller-driven airplane to be powered entirely by a fuel cell was flown. The fuel cell was a stack design that allowed the fuel cell to be integrated with the plane's aerodynamic surfaces. Fuel cell-powered unmanned aerial vehicles (UAV) include a Horizon fuel cell UAV that set the record distance flown for a small UAV in 2007. Boeing researchers and industry partners throughout Europe conducted experimental flight tests in February 2008 of a manned airplane powered only by a fuel cell and lightweight batteries. The fuel cell demonstrator airplane, as it was called, used a proton exchange membrane (PEM) fuel cell/lithium-ion battery hybrid system to power an electric motor, which was coupled to a conventional propeller. In 2016 a Raptor E1 drone made a successful test flight using a fuel cell that was lighter than the lithium-ion battery it replaced. The flight lasted 10 minutes at an altitude of 80 metres (260 ft), although the fuel cell reportedly had enough fuel to fly for two hours. The fuel was contained in approximately 100 solid 1 square centimetre (0.16 sq in) pellets composed of a proprietary chemical within an unpressurized cartridge. The pellets are physically robust and operate at temperatures as warm as 50 °C (122 °F). The cell was from Arcola Energy. The world's first fuel-cell boat HYDRA used an AFC system with 6.5 kW net output. Iceland has committed to converting its vast fishing fleet to use fuel cells to provide auxiliary power by 2015 and, eventually, to provide primary power in its boats. Amsterdam recently introduced its first fuel cell-powered boat that ferries people around the city's canals. The Type 212 submarines of the German and Italian navies use fuel cells to remain submerged for weeks without the need to surface. The U212A is a non-nuclear submarine developed by German naval shipyard Howaldtswerke Deutsche Werft. The system consists of nine PEM fuel cells, providing between 30 kW and 50 kW each. The ship is silent, giving it an advantage in the detection of other submarines. A naval paper has theorized about the possibility of a nuclear-fuel cell hybrid whereby the fuel cell is used when silent operations are required and then replenished from the Nuclear reactor (and water). Portable fuel cell systems are generally classified as weighing under 10 kg and providing power of less than 5 kW. The potential market size for smaller fuel cells is quite large with an up to 40% per annum potential growth rate and a market size of around $10 billion, leading a great deal of research to be devoted to the development of portable power cells. Within this market two groups have been identified. The first is the microfuel cell market, in the 1-50 W range for power smaller electronic devices. The second is the 1-5 kW range of generators for larger scale power generation (e.g. military outposts, remote oil fields). Microfuel cells are primarily aimed at penetrating the market for phones and laptops. This can be primarily attributed to the advantageous energy density provided by fuel cells over a lithium-ion battery, for the entire system. For a battery, this system includes the charger as well as the battery itself. For the fuel cell this system would include the cell, the necessary fuel and peripheral attachments. Taking the full system into consideration, fuel cells have been shown to provide 530Wh/kg compared to 44 Wh/kg for lithium ion batteries. However, while the weight of fuel cell systems offer a distinct advantage the current costs are not in their favor. while a battery system will generally cost around $1.20 per Wh, fuel cell systems cost around $5 per Wh, putting them at a significant disadvantage. As power demands for cell phones increase, fuel cells could become much more attractive options for larger power generation. The demand for longer on time on phones and computers is something often demanded by consumers so fuel cells could start to make strides into laptop and cell phone markets. The price will continue to go down as developments in fuel cells continues to accelerate. Current strategies for improving micro fuelcells is through the use of carbon nanotubes. It was shown by Girishkumar et al. that depositing nanotubes on electrode surfaces allows for substantially greater surface area increasing the oxygen reduction rate. Fuel cells for use in larger scale operations also show much promise. Portable power systems that use fuel cells can be used in the leisure sector (i.e. RVs, cabins, marine), the industrial sector (i.e. power for remote locations including gas/oil wellsites, communication towers, security, weather stations), and in the military sector. SFC Energy is a German manufacturer of direct methanol fuel cells for a variety of portable power systems. Ensol Systems Inc. is an integrator of portable power systems, using the SFC Energy DMFC. The key advantage of fuel cells in this market is the great power generation per weight. While fuel cells can be expensive, for remote locations that require dependable energy fuel cells hold great power. For a 72-h excursion the comparison in weight is substantial, with a fuel cell only weighing 15 pounds compared to 29 pounds of batteries needed for the same energy. telecommunication equipment and modern naval ships. An uninterrupted power supply (UPS) provides emergency power and, depending on the topology, provide line regulation as well to connected equipment by supplying power from a separate source when utility power is not available. Unlike a standby generator, it can provide instant protection from a momentary power interruption. Hybrid vehicles, pairing the fuel cell with either an ICE or a battery. Notebook computers for applications where AC charging may not be readily available. Portable charging docks for small electronics (e.g. a belt clip that charges a cell phone or PDA). Food preservation, achieved by exhausting the oxygen and automatically maintaining oxygen exhaustion in a shipping container, containing, for example, fresh fish. Breathalyzers, where the amount of voltage generated by a fuel cell is used to determine the concentration of fuel (alcohol) in the sample. Carbon monoxide detector, electrochemical sensor. In 2013, The New York Times reported that there were "10 hydrogen stations available to the public in the entire United States: one in Columbia, S.C., eight in Southern California and the one in Emeryville". As of December 2016[update], there were 31 publicly accessible hydrogen refueling stations in the US, 28 of which were located in California. A public hydrogen refueling station in Iceland operated from 2003 to 2007. It served three buses in the public transport net of Reykjavík. The station produced its own hydrogen with an electrolyzing unit. The 14 stations in Germany were planned to be expanded to 50 by 2015 through its public–private partnership Now GMBH. By May 2017, there were 91 hydrogen fueling stations in Japan. As of 2016, Norway planned to build a network of hydrogen stations between the major cities, starting in 2017. In 2012, fuel cell industry revenues exceeded $1 billion market value worldwide, with Asian pacific countries shipping more than 3/4 of the fuel cell systems worldwide. However, as of January 2014, no public company in the industry had yet become profitable. There were 140,000 fuel cell stacks shipped globally in 2010, up from 11,000 shipments in 2007, and from 2011 to 2012 worldwide fuel cell shipments had an annual growth rate of 85%. Tanaka Kikinzoku expanded its manufacturing facilities in 2011. Approximately 50% of fuel cell shipments in 2010 were stationary fuel cells, up from about a third in 2009, and the four dominant producers in the Fuel Cell Industry were the United States, Germany, Japan and South Korea. The Department of Energy Solid State Energy Conversion Alliance found that, as of January 2011, stationary fuel cells generated power at approximately $724 to $775 per kilowatt installed. In 2011, Bloom Energy, a major fuel cell supplier, said that its fuel cells generated power at 9–11 cents per kilowatt-hour, including the price of fuel, maintenance, and hardware. Industry groups predict that there are sufficient platinum resources for future demand, and in 2007, research at Brookhaven National Laboratory suggested that platinum could be replaced by a gold-palladium coating, which may be less susceptible to poisoning and thereby improve fuel cell lifetime. Another method would use iron and sulphur instead of platinum. This would lower the cost of a fuel cell (as the platinum in a regular fuel cell costs around US$1,500, and the same amount of iron costs only around US$1.50). The concept was being developed by a coalition of the John Innes Centre and the University of Milan-Bicocca. PEDOT cathodes are immune to monoxide poisoning. In 2016, Samsung "decided to drop fuel cell-related business projects, as the outlook of the market isn't good". 2005: Georgia Institute of Technology researchers used triazole to raise the operating temperature of PEM fuel cells from below 100 °C to over 125 °C, claiming this will require less carbon-monoxide purification of the hydrogen fuel. 2008: Monash University, Melbourne used PEDOT as a cathode. 2009: Researchers at the University of Dayton, in Ohio, showed that arrays of vertically grown carbon nanotubes could be used as the catalyst in fuel cells. The same year, a nickel bisdiphosphine-based catalyst for fuel cells was demonstrated. 2013: British firm ACAL Energy developed a fuel cell that it said can run for 10,000 hours in simulated driving conditions. It asserted that the cost of fuel cell construction can be reduced to $40/kW (roughly $9,000 for 300 HP). 2014: Researchers in Imperial College London developed a new method for regeneration of hydrogen sulfide contaminated PEFCs. They recovered 95–100% of the original performance of a hydrogen sulfide contaminated PEFC. They were successful in rejuvenating a SO2 contaminated PEFC too. This regeneration method is applicable to multiple cell stacks. ^ Khurmi, R. S. (2014). Material Science. S. Chand & Company. ^ Prabhu, Rahul R. (13 January 2013). "Stationary Fuel Cells Market size to reach 350,000 Shipments by 2022". Renew India Campaign. Retrieved 14 January 2013. ^ "Mr. W. R. Grove on a new Voltaic Combination". The London and Edinburgh Philosophical Magazine and Journal of Science. 1838. Retrieved 2 October 2013. ^ Grove, William Robert (1839). "On Voltaic Series and the Combination of Gases by Platinum". Philosophical Magazine and Journal of Science. XIV (86–87): 127–130. doi:10.1080/14786443908649684. ^ "On the Voltaic Polarization of Certain Solid and Fluid Substances" (PDF). The London and Edinburgh Philosophical Magazine and Journal of Science. 1839. Archived from the original (PDF) on 5 October 2013. Retrieved 2 October 2013. ^ Grove, William Robert (1842). "On a Gaseous Voltaic Battery". Philosophical Magazine and Journal of Science. XXI (140): 417–420. doi:10.1080/14786444208621600. ^ Larminie, James; Dicks, Andrew. Fuel Cell Systems Explained (PDF). ^ "Fuel Cell Project: PEM Fuel Cells photo #2". ^ "Collecting the History of Proton Exchange Membrane Fuel Cells". ^ "Roger Billings Biography". International Association for Hydrogen Energy. Retrieved 8 March 2011. ^ "Spotlight on Dr. Roger Billings". Computer Technology Review. Retrieved 21 September 2015. ^ "The PureCell Model 400 – Product Overview". UTC Power. Archived from the original on 11 December 2011. Retrieved 2011-12-22. ^ "S.Res.217 – A resolution designating October 8, 2015, as "National Hydrogen and Fuel Cell Day"". Congress.gov. 29 September 2015. ^ "Fuel Cells - EnergyGroove.net". EnergyGroove.net. Retrieved 6 February 2018. ^ a b "Reliable High Performance Textile Materials". Tex Tech Industries. Retrieved 6 February 2018. ^ Larminie, James (1 May 2003). Fuel Cell Systems Explained, Second Edition. SAE International. ISBN 978-0-7680-1259-0. ^ Wang, J.Y. (2008). "Pressure drop and flow distribution in parallel-channel of configurations of fuel cell stacks: U-type arrangement". International Journal of Hydrogen Energy. 33 (21): 6339–6350. doi:10.1016/j.ijhydene.2008.08.020. ^ Wang, J.Y. ; Wang, H.L. (2012). "Flow field designs of bipolar plates in PEM fuel cells: theory and applications". Fuel Cells. 12 (6): 989–1003. doi:10.1002/fuce.201200074. ^ Wang, J.Y. ; Wang, H.L. (2012). "Discrete approach for flow-field designs of parallel channel configurations in fuel cells". International Journal of Hydrogen Energy. 37 (14): 10881–10897. doi:10.1016/j.ijhydene.2012.04.034. ^ Kakati, B. K.; Deka, D. (2007). "Effect of resin matrix precursor on the properties of graphite composite bipolar plate for PEM fuel cell". Energy & Fuels. 21 (3): 1681–1687. doi:10.1021/ef0603582. ^ "LEMTA – Our fuel cells". Perso.ensem.inpl-nancy.fr. Archived from the original on 21 June 2009. Retrieved 21 September 2009. ^ Yin, Xi; Lin, Ling; Chung, Hoon T; Komini Babu, Siddharth; Martinez, Ulises; Purdy, Geraldine M; Zelenay, Piotr (4 August 2017). "Effects of MEA Fabrication and Ionomer Composition on Fuel Cell Performance of PGM-Free ORR Catalyst". ECS Transactions. 77 (11): 1273–1281. doi:10.1149/07711.1273ecst. ^ Kakati, B. K.; Mohan, V. (2008). "Development of low cost advanced composite bipolar plate for P.E.M. fuel cell". Fuel Cells. 08 (1): 45–51. doi:10.1002/fuce.200700008. ^ Kakati, B. K.; Deka, D. (2007). "Differences in physico-mechanical behaviors of resol and novolac type phenolic resin based composite bipolar plate for proton exchange membrane (PEM) fuel cell". Electrochimica Acta. 52 (25): 7330–7336. doi:10.1016/j.electacta.2007.06.021. ^ "Ballard Power Systems: Commercially Viable Fuel Cell Stack Technology Ready by 2010". 29 March 2005. Archived from the original on 27 September 2007. Retrieved 27 May 2007. ^ a b Online, Science (2 August 2008). "2008 – Cathodes in fuel cells". Abc.net.au. Retrieved 21 September 2009. ^ Wang, Shuangyin (2011). "Polyelectrolyte Functionalized Carbon Nanotubes as Efficient Metal-free Electrocatalysts for Oxygen Reduction". Journal of the American Chemical Society. 133 (14): 5182–5185. doi:10.1021/ja1112904. PMID 21413707. ^ Notter, Dominic A.; Kouravelou, Katerina; Karachalios, Theodoros; Daletou, Maria K.; Haberland, Nara Tudela (2015). "Life cycle assessment of PEM FC applications: electric mobility and μ-CHP". Energy Environ. Sci. 8 (7): 1969–1985. doi:10.1039/C5EE01082A. ^ "Water_and_Air_Management". Ika.rwth-aachen.de. Archived from the original on 14 January 2009. Retrieved 2009-09-21. ^ Andersson, M.; Beale, S. B.; Espinoza, M.; Wu, Z.; Lehnert, W. (15 October 2016). "A review of cell-scale multiphase flow modeling, including water management, in polymer electrolyte fuel cells". Applied Energy. 180: 757–778. doi:10.1016/j.apenergy.2016.08.010. ^ "Progress and Accomplishments in Hydrogen and Fuel Cells" (PDF). Archived from the original (PDF) on 23 November 2015. Retrieved 16 May 2015. ^ a b "Collecting the History of Phosphoric Acid Fuel Cells". ^ "Phosphoric Acid Fuel Cells". scopeWe - a Virtual Engineer. ^ Haile, Sossina M.; Boysen, Dane A.; Chisholm, Calum R. I.; Merle, Ryan B. (19 April 2001). "Solid acids as fuel cell electrolytes". Nature. 410 (6831): 910–913. Bibcode:2001Natur.410..910H. doi:10.1038/35073536. ISSN 0028-0836. PMID 11309611. ^ Haile, Sossina M.; Chisholm, Calum R. I.; Sasaki, Kenji; Boysen, Dane A.; Uda, Tetsuya (11 December 2006). "Solid acid proton conductors: from laboratory curiosities to fuel cell electrolytes". Faraday Discussions. 134: 17–39. Bibcode:2007FaDi..134...17H. doi:10.1039/B604311A. ISSN 1364-5498. ^ Williams, K.R. (1 February 1994). "Francis Thomas Bacon. 21 December 1904-24 May 1992" (PDF). Biographical Memoirs of Fellows of the Royal Society. 39: 2–9. doi:10.1098/rsbm.1994.0001. Retrieved 5 January 2015. ^ Stambouli, A. Boudghene (2002). "Solid oxide fuel cells (SOFCs): a review of an environmentally clean and efficient source of energy". Renewable and Sustainable Energy Reviews. 6 (5): 433–455. doi:10.1016/S1364-0321(02)00014-X. ^ "Methane Fuel Cell Subgroup". University of Virginia. 2012. Retrieved 13 February 2014. ^ A Kulkarni; FT Ciacchi; S Giddey; C Munnings; SPS Badwal; JA Kimpton; D Fini (2012). "Mixed ionic electronic conducting perovskite anode for direct carbon fuel cells". International Journal of Hydrogen Energy. 37 (24): 19092–19102. doi:10.1016/j.ijhydene.2012.09.141. ^ S. Giddey; S.P.S. Badwal; A. Kulkarni; C. Munnings (2012). "A comprehensive review of direct carbon fuel cell technology". Progress in Energy and Combustion Science. 38 (3): 360–399. doi:10.1016/j.pecs.2012.01.003. ^ Hill, Michael. "Ceramic Energy: Material Trends in SOFC Systems". Ceramic Industry, 1 September 2005. ^ a b c d e Badwal, Sukhvinder P. S.; Giddey, Sarbjit S.; Munnings, Christopher; Bhatt, Anand I.; Hollenkamp, Anthony F. (24 September 2014). "Emerging electrochemical energy conversion and storage technologies". Frontiers in Chemistry. 2: 79. Bibcode:2014FrCh....2...79B. doi:10.3389/fchem.2014.00079. PMC 4174133. PMID 25309898. ^ "Fuel Cell Comparison Chart" (PDF). Archived from the original (PDF) on 1 March 2013. Retrieved 10 February 2013. ^ E. Harikishan Reddy; Jayanti, S (15 December 2012). "Thermal management strategies for a 1 kWe stack of a high temperature proton exchange membrane fuel cell". Applied Thermal Engineering. 48: 465–475. doi:10.1016/j.applthermaleng.2012.04.041. ^ a b c d e f g h i j "Fuel Cell Technologies Program: Glossary" Archived 23 February 2014 at the Wayback Machine. Department of Energy Energy Efficiency and Renewable Energy Fuel Cell Technologies Program. 7 July 2011. Accessed 3 August 2011. ^ Von Helmolt, R.; Eberle, U (20 March 2007). "Fuel Cell Vehicles:Status 2007". Journal of Power Sources. 165 (2): 833–843. Bibcode:2007JPS...165..833V. doi:10.1016/j.jpowsour.2006.12.073. ^ "Honda FCX Clarity – Fuel cell comparison". Honda. Retrieved 2 January 2009. ^ "Efficiency of Hydrogen PEFC, Diesel-SOFC-Hybrid and Battery Electric Vehicles" (PDF). 15 July 2003. Archived from the original (PDF) on 21 October 2006. Retrieved 23 May 2007. ^ "Batteries, Supercapacitors, and Fuel Cells: Scope". Science Reference Services. 20 August 2007. Retrieved 11 February 2009. ^ Garcia, Christopher P.; et al. (January 2006). "Round Trip Energy Efficiency of NASA Glenn Regenerative Fuel Cell System". Preprint: 5. hdl:2060/20060008706. ^ a b "Fuel Cell Basics: Benefits". Fuel Cells 2000. Archived from the original on 28 September 2007. Retrieved 27 May 2007. ^ "Fuel Cell Basics: Applications" Archived 15 May 2011 at the Wayback Machine. Fuel Cells 2000. Accessed 2 August 2011. ^ "Energy Sources: Electric Power". U.S. Department of Energy. Accessed 2 August 2011. ^ "2008 Fuel Cell Technologies Market Report" Archived 4 September 2012 at the Wayback Machine. Bill Vincent of the Breakthrough Technologies Institute, Jennifer Gangi, Sandra Curtin, and Elizabeth Delmont. Department of Energy Energy Efficiency and Renewable Energy. June 2010. ^ U.S. Fuel Cell Council Industry Overview 2010, p. 12. U.S. Fuel Cell Council. 2010. ^ "Town's Answer to Clean Energy is Blowin' in the Wind: New Wind Turbine Powers Hydrogen Car Fuel Station". Town of Hempstead. Archived from the original on 28 January 2012. Retrieved 13 January 2012. ^ "Reduction of residential carbon dioxide emissions through the use of small cogeneration fuel cell systems – Combined heat and power systems". IEA Greenhouse Gas R&D Programme (IEAGHG). 11 November 2008. Archived from the original on 3 December 2013. Retrieved 1 July 2013. ^ "Reduction of residential carbon dioxide emissions through the use of small cogeneration fuel cell systems – Scenario calculations". IEA Greenhouse Gas R&D Programme (IEAGHG). 11 November 2008. Archived from the original on 26 October 2013. Retrieved 1 July 2013. ^ "Patent 7,334,406". Retrieved 25 August 2011. ^ "Geothermal Heat, Hybrid Energy Storage System". Retrieved 25 August 2011. ^ "Reduction of residential carbon dioxide emissions through the use of small cogeneration fuel cell systems – Commercial sector". IEA Greenhouse Gas R&D Programme (IEAGHG). 11 November 2008. Archived from the original on 5 March 2018. Retrieved 1 July 2013. ^ "PureCell Model 400: Overview" Archived 14 May 2011 at the Wayback Machine. UTC Power. Accessed 2 August 2011. ^ "Comparison of Fuel Cell Technologies" Archived 1 March 2013 at the Wayback Machine. Departement of Energy Energy Efficiency and Renewable Energy Fuel Cell Technologies Program. February 2011. ^ Onovwiona, H.I. ; Ugursal, V.I. (2006). "Residential cogeneration systems: review of the current technology". Renewable and Sustainable Energy Reviews. 10 (5): 389–431. doi:10.1016/j.rser.2004.07.005. ^ AD. Hawkes, L. Exarchakos, D. Hart, MA. Leach, D. Haeseldonckx, L. Cosijns and W. D’haeseleer. EUSUSTEL work package 3: Fuell cells, 2006. ^ "Reduction of residential carbon dioxide emissions through the use of small cogeneration fuel cell systems". IEA Greenhouse Gas R&D Programme (IEAGHG). 11 November 2008. Archived from the original on 4 May 2018. Retrieved 1 July 2013. ^ "HyER " Enfarm, enefield, eneware!". Archived from the original on 15 February 2016. ^ "Global Hydrogen Fuel Cell Vehicle Sales Seeing Progress - HybridCars.com". HybridCars.com. 9 February 2018. Retrieved 26 March 2018. ^ "Fuel Cell Electric Vehicles". Community Environmental Council. Retrieved 26 March 2018. ^ a b Lathia, Rutvik Vasudev; Dobariya, Kevin S.; Patel, Ankit (10 January 2017). "Hydrogen Fuel Cells for Road Vehicles". Journal of Cleaner Production. 141: 462. doi:10.1016/j.jclepro.2016.09.150. ^ Lammers, Heather (17 August 2011). "Low Emission Cars Under NREL's Microscope". NREL Newsroom. Archived from the original on 25 September 2011. Retrieved 21 August 2011. ^ Korzeniewski, Jeremy (27 September 2012). "Hyundai ix35 lays claim to world's first production fuel cell vehicle title". autoblog.com. Retrieved 7 October 2012. ^ "Hydro Dip: 2017 Honda Clarity Fuel-Cell Leases Cheaper Than Initially Expected". Retrieved 26 March 2018. ^ "From TechnologyReview.com "Hell and Hydrogen", March 2007". Technologyreview.com. Retrieved 31 January 2011. ^ White, Charlie (31 July 2008). "Hydrogen fuel cell vehicles are a fraud". DVICE. Archived from the original on 19 June 2014. Retrieved 21 September 2015. ^ "Transportation Fleet Vehicles: Overview" Archived 17 October 2011 at the Wayback Machine. UTC Power. Accessed 2 August 2011. ^ "FY 2010 annual progress report: VIII.0 Technology Validation Sub-Program Overview".John Garbak. Department of Energy Hydrogen Program. ^ "European Fuel Cell Bus Project Extended by One Year". DaimlerChrysler. Archived from the original on 29 September 2007. Retrieved 31 March 2007. ^ "Fuel cell buses". Transport for London. Archived from the original on 13 May 2007. Retrieved 1 April 2007. ^ "UTC Power – Fuel Cell Fleet Vehicles". Archived from the original on 9 February 2012. ^ "Ônibus brasileiro movido a hidrogênio começa a rodar em São Paulo" (in Portuguese). Inovação Tecnológica. 8 April 2009. Retrieved 3 May 2009. ^ "HyLIFT - Clean Efficient Power for Materials Handling". ^ "First Hydrogen Station for Fuel Cell Forklift Trucks in France, for IKEA". ^ "Technologie HyPulsion : des piles pour véhicules de manutention - Horizon Hydrogène Énergie". ^ "HyGear Delivers Hydrogen System for Fuel Cell Based Forklift Trucks". ^ "Creating Innovative Graphite Solutions for Over 125 Years". GrafTech International. Archived from the original on 6 December 2010. ^ "The ENV Bike". Intelligent Energy. Archived from the original on 6 March 2008. Retrieved 27 May 2007. ^ "Honda Develops Fuel Cell Scooter Equipped with Honda FC Stack". Honda Motor Co. 24 August 2004. Archived from the original on 2 April 2007. Retrieved 27 May 2007. ^ Bryant, Eric (21 July 2005). "Honda to offer fuel-cell motorcycle". autoblog.com. Archived from the original on 16 July 2012. Retrieved 27 May 2007. ^ 15. Dezember 2007. "Hydrogen Fuel Cell electric bike". Youtube.com. Retrieved 21 September 2009. ^ "Horizon fuel cell vehicles: Transportation: Light Mobility" Archived 22 July 2011 at the Wayback Machine. Horizon Fuel Cell Technologies. 2010. Accessed 2 August 2011. ^ Burgman_Fuel-Cell_Scooter; "Products History 2000s". Global Suzuki. Suzuki Motor Corporation. Archived from the original on 24 October 2013. Retrieved 25 October 2013. ^ "Eco energy firm in Suzuki deal". Leicester Mercury. 6 February 2012. Archived from the original on 29 October 2013. Retrieved 26 October 2013. ; "Suzuki and IE to commercialize FC cars and bikes". Gizmag. 8 February 2012. Retrieved 26 October 2013. ^ "Horizon Fuel Cell Powers New World Record in UAV Flight" Archived 14 October 2011 at the Wayback Machine. Horizon Fuel Cell Technologies. 1 November 2007. ^ "Boeing Successfully Flies Fuel Cell-Powered Airplane". Archived from the original on 9 May 2013. . Boeing. 3 April 2008. Accessed 2 August 2011. ^ "Fuel Cell Powered UAV Completes 23-hour Flight". Alternative Energy: News. 22 October 2009. Accessed 2 August 2011. ^ CNBC.com, Anmar Frangoul | Special to (2 February 2016). "Hydrogen fuel cells… on a plane?". CNBC. Retrieved 6 February 2018. ^ "Hydrogen-powered unmanned aircraft completes set of tests".www.theengineer.co.uk. 20 June 2011. Accessed 2 August 2011. ^ Coxworth, Ben (8 February 2016). "Drone flight powered by lightweight hydrogen-producing pellets". www.gizmag.com. Retrieved 9 February 2016. ^ "Lovers introduces zero-emission boat" (in Dutch). NemoH2. 28 March 2011. Accessed 2 August 2011. ^ "Super-stealth sub powered by fuel cell" Archived 4 August 2011 at the Wayback Machine. Frederik Pleitgen. CNN Tech: Nuclear Weapons. 22 February 2011. Accessed 2 August 2011. ^ Goodenough, RH; Greig, A (2008). "Hybrid nuclear/fuel-cell submarine". Journal of Naval Engineering. 44 (3): 455–471. ^ a b Agnolucci, Paolo (December 2007). "Economics and market prospects of portable fuel cells". International Journal of Hydrogen Energy. 32 (17): 4319–4328. doi:10.1016/j.ijhydene.2007.03.042. Retrieved 1 March 2018. ^ a b c Dyer, C.K> (April 2002). "Fuel cells for portable applications". Journal of Power Sources. 106 (1–2): 31–34. Bibcode:2002JPS...106...31D. doi:10.1016/S0378-7753(01)01069-2. ^ Girishkumar, G.; Vinodgopal, K.; Kamat, Prashant (2004). "Carbon Nanostructures in Portable Fuel Cells: Single-Walled Carbon Nanotube Electrodes for Methanol Oxidation and Oxygen Reduction". J. Phys. Chem. 108 (52): 19960–19966. doi:10.1021/jp046872v. ^ "Ensol Systems Inc. - Remote Power Systems, EFOY Pro Fuel Cells, Electrical Control Panels". ^ "Ballard fuel cells to power telecom backup power units for motorola" Archived 6 July 2011 at the Wayback Machine. Association Canadienne de l'hydrogene et des piles a combustible. 13 July 2009. Accessed 2 August 2011. ^ "Cottbus receives new local data center" Archived 30 September 2011 at the Wayback Machine. T Systems. 21 March 2011. ^ Laine Welch (18 May 2013). "Laine Welch: Fuel cell technology boosts long-distance fish shipping". Anchorage Daily News. Archived from the original on 9 June 2013. Retrieved 19 May 2013. ^ "Fuel Cell Technology Applied to Alcohol Breath Testing". Intoximeters, Inc. Retrieved 24 October 2013. ^ "EHA " German Government announces support for 50 urban hydrogen refuelling stations". ^ "NOW: now-gmbh.de - Startseite". ^ Martin, Christopher (10 March 2014). "Plug, FuelCell Climb as 'Experiments' Seen as Profitable". Bloomberg.com. Retrieved 28 December 2015. ^ "Fuel cell report highlights continued growth in material handling applications". 20 November 2013. ^ Johnson, R. Colin (22 January 2007). "Gold is key to ending platinum dissolution in fuel cells". EETimes.com. Retrieved 27 May 2007. ^ "C&EN: Latest News - Iron-Sulfur Core Assembled". ^ "Fuel cell improvements raise hopes for clean, cheap energy". Ars Technica. ^ "Chemical Could Revolutionize Polymer Fuel Cells" (PDF). Georgia Institute of Technology. 24 August 2005. Retrieved 21 November 2014. ^ "Bio-inspired catalyst design could rival platinum". 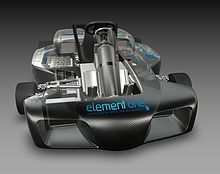 ^ "Hydrogen Fuel Cell That's As Durable As A Conventional Engine". Archived from the original on 16 October 2013. ^ Kakati, Biraj Kumar; Kucernak, Anthony RJ (15 March 2014). "Gas phase recovery of hydrogen sulfide contaminated polymer electrolyte membrane fuel cells". Journal of Power Sources. 252: 317–326. Bibcode:2014JPS...252..317K. doi:10.1016/j.jpowsour.2013.11.077. ^ Kakati, Biraj Kumar; Unnikrishnan, Anusree; Rajalakshmi, Natarajan; Jafri, RI; Dhathathreyan, KS (2016). "Kucernak". Anthony RJ. 41 (12): 5598–5604. doi:10.1016/j.ijhydene.2016.01.077. hdl:10044/1/28872. ^ Kakati, BK. "In-situ O3 rejuvenation of SO2 contaminated Polymer Electrolyte Fuel Cell: Electrochemistry, single cell and 5-cells stack studies" (PDF). 5th European PEFC & H2 Forum. Retrieved 14 July 2015. Vielstich, W.; et al., eds. (2009). Handbook of fuel cells: advances in electrocatalysis, materials, diagnostics and durability. Hoboken: John Wiley and Sons. James Larminie; Andrew Dicks (2003). Fuel Cell Systems Explained (Second ed.). Hoboken: John Wiley and Sons. Noriko Hikosaka Behling (2012). Fuel Cells: Current Technology Challenges and Future Research Needs (First ed.). Elsevier Academic Press. This page was last edited on 23 April 2019, at 22:27 (UTC).